Students will find the errors in this Venn Diagram of the rational number system. Once they find the errors, students will write about the errors and what they will fix them. 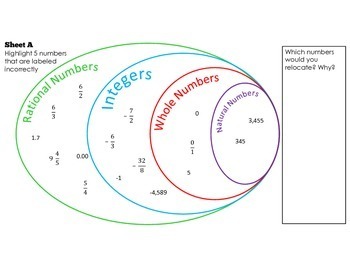 These Venn Diagrams include numbers in different forms, including improper fractions that are equivalent to whole numbers. Great for homework, early finisher activity, or a collaborative assignment. I have included two different Venn Diagrams for students to analyze.